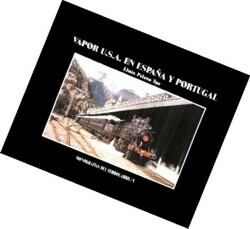 Steam U.S.A. in Spain and Portugal is a work of historical and photographic summary of all the locomotives with traction to steam constructed in the United States of America that have worked in the railway networks of the Iberian peninsula. - Between the last third of the 19th century and beginning of the XXth. The economic structures and the contacts proceeding from Cuba played a key role in the arrival of American locomotives even after the war of 198 against The United States. - The I World war. The Spanish neutrality forced to acquire with character of urgency a considerable park of locomotives for the increase of traffics and the improvement of the transport tied to the mining developments. - The World War II. Not belligerancy of Spain in the war praised towards the countries of the axis it did not make her a beneficiary in the first moment of the American help to the reconstruction like to most of the European countries. On the other hand, Portugal benefited from a lot of American locomotives for his network. In the 50s, the American help to the pro-Franco government made possible the arrival of railway material of 2 ª hand like the steam locomotives is U.S. Army to the “Fc. de Langreo”. The American inventors have contributed great part of the innovations of the steam locomotive or in other cases they have improved them, versioned or spread elements designed by Europeans. The standardization, the increases of power in the traction steam and definitively the innovations of the last locomotives of steam were proceeding in his most of American builders. In addition, the aesthetics of the American locomotive, fruit of the standardization and his production in series have characterized his attraction. The book also dedicates a part to the American locomotives conceived to the military services in the world wars, and the given ones for the reconstruction of the European networks. Size: 22 X 21 X 1 cm.